It would appear that the management at Warner Springs has decided that since the ranch has a target date to close on January 16th, that they must concentrate their efforts to that end, and have therefore informed me that we will not be able to hold the endurance ride after all. I have sent a letter, asking them to reconsider, but it does not look like it will help. I will not officially cancel the ride on the aerc calendar until I get a final determination, but I do not have much hope that things will change. It things change, I will let you know. All days are AHA sanctioned for the 50 mile distances. All days will have Trail Rides - but we'll need to know in advance when/where you're going since we'll be out on the trail or at the vetchecks most of the first 4 days. There are a few changes (mostly adding mileage here and there and trying to get all the days work out right). Day 2 - we have permission to go into the foothills of Toy Mountain and ride the Alder Creek trail (the cows are all up higher grazing now). This is a very pretty trail. Day 3 - will be new for the Canyonlands - a loop north of the highway on some nice trails for the 50's, and then both distances will drop down into Joyce Ranch - ride several miles along the irrigation canal - really pretty actually, full of water, loaded with sunflowers and blooming rabbit brush. Lots of wildlife along this stretch. Then you'll ride around Sinker Reservoir and up lower Sinker Canyon - very pretty! It should be a nice day. Day 4 - will be the 'traditional' Sinker Canyon ride but the 50's will drop down into Sinker Creek farther down at the Joyce Ranch and ride through the ranch along the canal bank, and then up the entire stretch of canyon. Then the 50's will loop up into the hills on the way back after the vetcheck. Day's 1 - 4 will be big loop rides with out vet checks. Day 5 - two big loops with one vet check in camp - north into the Birds of Prey, and then south to Hart Creek. Dinners will be provided by Blue Canoe Restaurant - plus they'll be set up to serve food all day for those left in camp. It's been hot and dry the past couple months but there's still water in some of the creeks (a cold wet spring!!) and the trails are in pretty good shape. Pre-registration is open, please sign up if you think you're coming - even if you don't know which days for sure. We're expecting a lower turnout this year and really need to plan carefully for awards and meals. The Barefoot in New Mexico Ride is October 15 & 16. It is a two day hundred or two one day 50 mile rides near Alamogordo. There will also be LD rides each day. 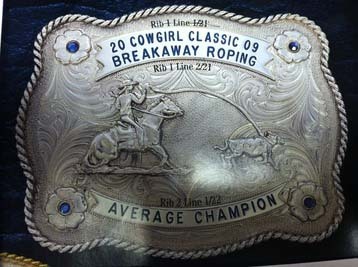 Phil and Marcelle have ordered the belt buckle for best condition in the two day 100; the buckle will have a beautiful silver horses head with mane and forelock flying instead of the roping horse/calf. For more information or the entry form visit the ride website at www.enchantedarabians.net. Let’s get out and support this new ride. The Riding to the Rescue CTR at Perry Lake near Topeka, Kansas is just under 6 weeks away. This summer has been a record breaker for our part of the country related to the drought and the heat. We are excited about the cool weather which just arrived. The weather experts are indicating that it should be with us for some time. Maybe even all the way through fall. Competitors AND volunteers (especially a Rules Interpreter) are needed so please contact Hope at hope@electricaldevelopment.com or use the RMS system (NATRC members) and get signed up. This has been a difficult year for rides in Region 6 but we still have the fall season and it should be GREAT!! Rendevouz was the past 2 days and they still had some hot weather to endure. Our ride should miss all that. Rider participation is the "make or break" for any ride so help us out by attending. We will also have a "Tack to the Rescue" event so please bring your new or lightly used items as a donation to the rescue and we will use them for a silent auction throughout the weekend. Looking forward to seeing everyone. It is time for a great weekend with great friends and wonderful horses!! The $50.00 late fee for the AERC National Championship Ride on August 25 and 27, 2011, near Capitan, New Mexico, will be waived to all riders who call or e-mail ride management with in the next couple days. Roger Taylor needs to get a count so that he can order the meals and awards as soon as possible. The ride plans are looking great, high desert mountain weather in New Mexico should be nice with highs near 80 and very cool nights. Everyone should support the ride this year and buy raffle tickets for the desert bred colt (donated by Edie Booth) or the two Specialized Saddles (donated by the Kaden's). Look on the the AERC.org website for more information. Held in the beautiful and historic William B. Bankhead National Forest, near, Moulton, Alabama. One of the Deep South's finest pockets of deep woods, Alabama's William B. Bankhead National Forest has a potential for adventure and natural beauty you'd expect of a bigger, wilder place. The forest's 180,000 acres encompass pine-clad and hardwood forest, streams, deep gorges, and an arkful of wildlife. Thread your way into one of its deeper hollows and you'll find stands of giant, ancient trees; in typical southern Appalachian fashion, they'll likely be a diverse lot that includes yellow pine, eastern hemlock, and cucumber magnolia all jumbled together. And the music of falling water will almost certainly be heard wherever you go. Walking through the deep gorges is like walking into the “Land of the Lost”....be sure to stay alert, the dinosaurs of millions of years ago could be lurking in the dark ravines or rock ledges! The horse trails consists of 25 miles of carefully laid out design to protect the environment and to allow the user to explore the forest from horseback. About 95% of the trail consists of single track riding. There is usually plenty of natural water on the trails with the exception of during very dry weather. In such case, ride management will provide water on the trail. The terrain is gently rolling to moderate hills, little rock and generally good footing. The trails drain exceptionally well during wet weather. Cruppers and breast collars are not necessary, shoes recommended, but pads are not needed. There is some of gravel road, and less than .4 mile of pavement, that will be the access to the camp and vet checks. The start (rider check in) and finish line will be roughly .35 mile from camp on a gravel road. All vet checks will be in camp. The vet check area will be clearly marked, as well as the crewing areas. Vet check criteria will be declared at the pre-ride meeting by the head control judge. All decisions of the control judges will be final. All competitors will receive a T-Shirt completion award. Additional awards will be Top Ten, Best Condition, First Junior, First Mare to Finish, First place finisher, High Vet Score, Turtle, some breed awards and various “special” Raptor awards. Primitive camping, no people water, but horse water will be provided. Meals will consist of grilled ribeye steak sandwiches with choice of chips and drink. Additional meals may be purchased at check in @ $7/meal, but in order to plan please mark on your entry if you plan to purchase an additional meal. Rider’s meal are included in the entry fee. We are collecting a $10/rig parking fee that covers Thursday through Sunday use of the field to the landowner. This will be collected at check in. The Camas Creek Canter, on July 23 in Potomac, Montana, is coming up! Trails are marked, more water tanks added and another vet secured for the entries that keep coming. We dodged a buck in velvet while marking trails! Lots of green this year and you can view from the high trails snow in the distant mountains. Keeping our fingers crossed for the long term weather outlook of moderate temps. See you all soon! The Buckskin Challenge 25/50 Endurance ride and Trail Ride, sponsored by Team Endurance, was started as a "fun ride" and a way to expose local riders to endurance riding. 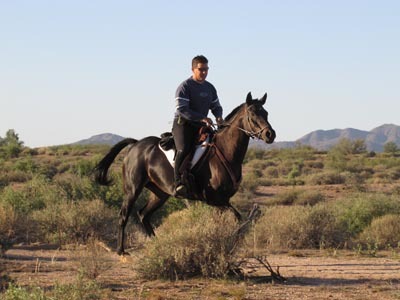 We have since been recognized by the American Endurance Ride Conference (AERC), the Pacific Northwest Endurance Rides (PNER) and the Arabian Horse Association (AHA). 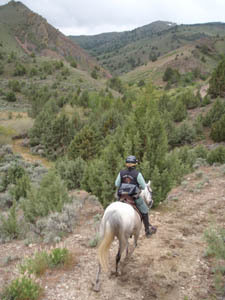 The ride camp is located approximately 5 miles from the I-15 Pocatello Creek Exit on private ground at the mouth of Buckskin canyon. There is water for animals in camp and limited potable water. There are portable toilets available in camp as well. Our head veterinarian is Matt Dredge, DVM. The pre-ride meeting will be held Friday evening at 7 PM in ride camp. Vetting of your horse can be done Friday evening from about 4 PM until the ride meeting and can be arranged Saturday morning with the vets. Preregister HERE for The 2011 Buckskin Challenge. There are only 11 places left in the Big Bear 55/100, located at the Heart Bar Equestrian Group Camp, San Bernardino National Forest. riders can make some time. It was about 80% single track, it is now about 60%. traverse, while the jeep road goes down into a valley and climbs back out again. out on the PCT, back on jeep roads. If you want a prep for Tevis, the 55 is good timing and good practice. If you want a smaller Tevis, the 100 should be more than enough challenge. of the PCT is some of the best riding they have ever done. The 31st 400km Shahzada Marathon endurance ride will be held from Monday, 22nd to Friday 26th August, 2011 and camping will be available in St Albans at the ride base from Sat 13th as well as accommodation at many local venues….check out the Shahzada website http://www.shahzadaresults.org/11entry.htm" for all the information you will need, reserve your favorite number, entry forms and campsite requests to be sent asap and read some of the stories from past rides to get you motivated……this is a very special event and if you don’t do anything else in endurance, you have to ride Shahzada!! The marathon event is run over five days on local roads and tracks – McKechnies, Woomera Path, Shepherds Gully, Johnny’s Hill, The Steps and Prestons – a great deal of work has been done on the course over the last few years and there will be track clearing on Saturday, 30th and Sunday 31st July…..if you can come and help please contact Brad Jones on 0249 821 758 or Haydn Fisher on 0263 733 932. These improved tracks, with the elimination of many tarred road verges and the wonderful help and advice from the veterinary panel during the ride over the last few years headed up by Dr. Kym Hagon, have helped to establish a very good completion rate – everyone who is successful receives a highly coveted Shahzada buckle. After riding and successfully completing Shahzada in 2010, Kym is back as Head Vet and together with wife Kim, the social committee promises you all heaps of fun during the week as well as “the ride of your life”. Jeff Bonham is back again this year as Chief Steward so book your holidays now and be prepared for a week to remember. In addition to the 400km event - there will be a 120 km Mini Marathon over three days (experience the passion and wonderful riding tracks of the Macdonald Valley without the pressure) – it is fantastic training for young horses and a perfect lead up to the Quilty in September. Come for the fun and the challenge – be part of the excitement – this is the premier ride of the endurance calendar and not to be missed. We have heaps of riders entering from Victoria and Queensland this year so St Albans will be buzzing. Kazan Stables of Malaysia is proudly sponsoring the Kazan Challenge on July 29, 30, and 31 in Wagin, Western Australia. It is an International and National event. Distances are an FEI*** 160 km World Endurance Championship Qualifier, an FEI** 120 km, FEI* 80 km, and 80 km Young Horse Challenge; plus a National WAERA 20 km Intro ride, 40 km Training ride, 80 km ride and 160 km elevated ride. The rescheduled Jo Tate Memorial I & II, 35, 50, 100 and intro rides, JUNE 25 & 26 is less than 2 weeks away. For anyone who has never been to this part of the country, southwest Missouri, (Washburn, Flag Springs Conservation Area) to ride let me tell you a little bit about this trail. First I will say that you won't find too many other trails that are as pretty as this one with a great variety of riding speeds and scenery. You will have fast going logging roads, hills with the typical Ozark rocks, sections of trails, lots of grass, ponds and creek crossings, with as many as 10 sources of water on 2 of the loops. Hoof protection is highly recommended even though the logging roads have soft shoulders. Ride times in the past have been from the fastest of just under 6 hours to using the full 12 hours. Can't get much better than that except for the weather and I've put my order in for normal to cool for that weekend. Typical high temps for that time of year is 85 with a low of 65. Humidity can vary. Keep your fingers crossed. If you have fans that you'd like to set up for vetting area you may. This is a primitive campsite with porta-pots and hauled in water. Since it is hauled in water and common tanks for all, please be prepared to have your own personal water buckets. Decisions will be made at ride meeting as to how we want to handle in camp watering. At this time all has been quiet on the EHV-1 virus according to the latest USDA update. Be sure to check this out for yourselves. Current health certificates required for all out of state horses as well as current Coggins!! Ride flyer and entry available by going to AERC's ride calendar page. Since ride entries have been down for many recent rides it is very important to please RSVP to me as you have done in the past. I need to know how many are coming and the distance you plan on riding AND ON WHAT DAY!! I have offered the Sunday ride for many years now and it has always just paid for itself so it's important that I know who's coming to ride on Sunday, the second day, by June 19 so that I can make a decision and let you know. If there are not enough riders for Sunday I will do just a Saturday ride with all distances and the intro offered also. Please RSVP to jotatemem@yahoo.com or schlupranch@mo-net.com I do not have a facebook page so don't use that as your response to me. Or phone 417 850-9589 I do perfer the rsvp to be email but any questions please feel free to call. Thank you to all for your patience with me during our personal tragedy of stolen cattle and tornado destruction all on the same day. Compared to what many others have gone through and the endurance family's own recent personal loss, mine is just a bump in the road. Thanks for the detour, hope to see lots of new faces!!! Please pass the word to any others tht I have missed. Entries are open for the Llano Estacado Challenge online, and we would love to have you join us. The ride is June 18-19 at Lake Meredith Recreation Area (Plum Creek) North of Amarillo, Texas. The new solar water well is in and working. The well has been a three year project of the club, working with the Lake Meredith National Recreation Area, and has finally been achieved. Remember too that the road into the camp is now an all weather road and there is no danger of getting stuck in the mud. In fact, we're on the dry side around here and would enjoy a little water. In lieu of the Strawberry Fields Ride being canceled, the Dorsey Creek ride in Otto, Wyoming has received special sanctioning from AERC to make the Dorsey Creek a two day ride. We will run on June 18 (our regular date) AND June 19 ( NEW DATE)!! Please let everyone know because we won't have time to get it in the Endurance News before we have the ride. Hope to see everyone there! Everything is marked, trimmed and ready at the Cherokee Wildlife Management Area in Zeb, OK! for the June 11 ride. The weather is forecasted to be in the 80's and there is a 30% chance of rain. I'll be reachable all day Thursday and will be in camp Friday morning. Give me a call or text with any questions. If you haven't already contacted me, please RSVP. There is no pre-entry required and we'd love to have you. We are having hamburgers Friday night so bring something to share if you wish. I've got the huge industrial fan for the vet check and a canopy. There is a lot of shade in camp as well as on trail. Every day I've marked trail, there has been a wonderful breeze blowing. Ahhhh...! Remember, this is a benefit ride for the Shriner's Transportation Fund. The Shriners use this fund to transport ill children to Shriner's Hospitals at no charge to the family. Remember we had to change camps. This ride will be in Zeb, OK, and NOT at Lake Oologah. We look forward to seeing you in camp! AERC office, for July 16-17, at Cooley Ranch, California. Dates have been changed on our website, www.cooleyranchrides.com. This is a fantastic two-day and a great training ride for Tevis! Sorry to announce that Strawberry Fields Forever Pioneer 25/50 endurance ride on June 17-19, 2011 in Utah. has been cancelled due to deep snow in the area. 2010-11 had record snowfall in the Western Rockies. The rivers are at the highest in almost 30 years. There are still snow fields, tundra style meadows and high, fast currents in the Strawberry River. Horse and rider safety might be compromised and it's just not worth the chance of an injury. Not to mention that as of this email, the ridecamp road is still snow drifted closed. Wow, that's a lot of snow!!! Ride On !!! 2012 will soon be scheduled so put it on your calendar for next year. We look forward to seeing you then. Look for the up coming dates for next year in the AERC ride calendar. I’m sure sorry to hear about Tevis being postponed. It will be cool to see the area at a different time of year, though. If your horse is ready and will be peaking for the Tevis, perhaps you should consider coming to Bandit Springs and ride the 100 the week before the regular scheduled Tevis. Bandit Springs is held 30 miles north east of Prineville OR in the incredibly lovely Ochoco National Forest. The ride isn’t point to point and there is some repetition (mostly in the dark so that you and your horse might find it familiar). But that’s a pretty normal thing on many 100s. What we DO have is elk, antelope, wild horses, incredible wild flowers, an abundance of water and grass and an incredible vet and volunteer crew. Mark July 9th on your calendar and join us! Pre-registration is appreciated (so we can get stuff into the computer early) but absolutely not required. The best email to reach me at is jwilde@wildevents.info. Oh, and if you have a friend interested in learning more about endurance, Friday we offer at no cost, Endurance 101. Three great mini-seminars in the morning for everyone and then the afternoon focuses on info for the newbie. Hope to see you at Bandit Springs…. Gold Country Endurance Riders would like to offer an opportunity for local and visiting equestrians to help raise the $20,000 match needed for a $738,000 grant to purchase 151 acres on Salmon Falls Road. This parcel will be designated for a trailhead and staging area. GCER will match the funds that are donated at the Gold Country Endurance Ride. We will have someone from the American River Conservancy at registration from 12:00 - 5:00 on Friday to answer any questions. This is a great opportunity to give Endurance a try! 30 milers have 7.5 hours and 50 milers have 12 hours to complete, there will be Veterinarian supervision and the away vet checks are arguably the best in all of Endurance. Crew is not allowed but riders and their horses are treated like royalty with tasty snacks and lots of GREAT volunteers. Please visit our website at www.gcer.org. The American River Conservancy (ARC) has been awarded a $738,000 competitive grant to purchase 151 acres on Salmon Falls Road that will serve as an equestrian trailhead for the South Fork American River trail. ARC believes this acquisition will allow equestrians to travel the entire trail from Highway 49 (Magnolia Ranch) all the way to Salmon Falls Road. Following the purchase of this land, ARC would work with the Bureau of Land Management and the equestrian community to build a trailhead large enough to accommodate pick-up trucks and horse trailers. In order to receive these grant funds and close escrow by our contractual date in late July, 2011 ARC must raise $20,000 as a local match to these grant funds. The purchase price is $758,000 and is equal to the fair market value as established by an independent appraiser. WE NEED HELP FROM THE COMMUNITY to complete the final equestrian link on this South Fork American River trail. Please donate whatever you can to help ARC complete this last equestrian link in the trail. 100% of your donation will be used toward the purchase price of the subject 151 acres of land. For more information, please contact Julie Andert or Noël Robinson at (530) 621-1224 or Elena DeLacy at (530) 295-2190. The Western States Trail Foundation has successfully developed a unique educational experience that has been proven to enable riders with knowledge and aptitude which has lead participants to a elevated Tevis Cup completion rate. Our 4th annual Tevis Educational Ride is quickly approaching. We are excited for the opportunity to share a wealth of knowledge from the breathtaking Tevis Cup trail. We will have informative speakers discussing relevant, cutting edge, endurance topics. Plan for a complete experience including entertainment, great food and wonderful company. Participants are sure to enjoy a hands-on learning experience from the moment of check-in Friday afternoon until the finish of the ride on Sunday. Due to the deep snow pack the Sierras have received this year, the WSTF may have to alter some staging areas and routes along the Tevis Cup trail, where necessary. The Tevis Educational Ride will do so similarly. We will make every effort to provide the most current information about the event and look forward to another great Tevis Educational Ride. See you Friday, June 10th! Volunteers are also needed. If you would like to help contact Terryl Reed (530) 346-8583 or would like more information on the Education Ride. Bottom Line: Camp RU Crazy?! will be held June 11 at Cherokee WMA, Zeb, Oklahoma (NOT at Lake Oologah!!!!!). Directions are the same for the Camp Cherokee Challenge on July 16. Well, I'm not surprised with all the rain. Link and I went to work on trails at Lake Oologah (Oklahoma -- Central Region) Friday and while we were working, the Lake level rose. The water rose to completely cover the wooden bridge, the earthen bridge and the inlet. The Lake was to the edge of trail in spots and covered the trail in other places. It's just a matter of time before we'd have to swim the trail. I don't know if the level will go down but I'm not counting on it. Lake Oologah is a flood control lake meaning the Corps will take the water from other places to control flooding there and will flood the Lake in the process. The lakes in northeastern Oklahoma are all over their banks and planning around something like this is a nightmare. I've had to make last-minute location changes since 2008 and I'm not doing so this year. We look forward to seeing you at Cherokee Wildlife Management Area! Remember, the proceeds from our 4 summer rides will go to the Shriner's Transportation Fund which is used to transport children to Shriner's Hospitals. Link, Dad and I are working hard to make a fun and easy trail. Come enjoy it with us!